Summertime is the time for carefree days with family and friends. With the sun blazing down, our favorite place to be in the summertime is someone’s swimming pool. 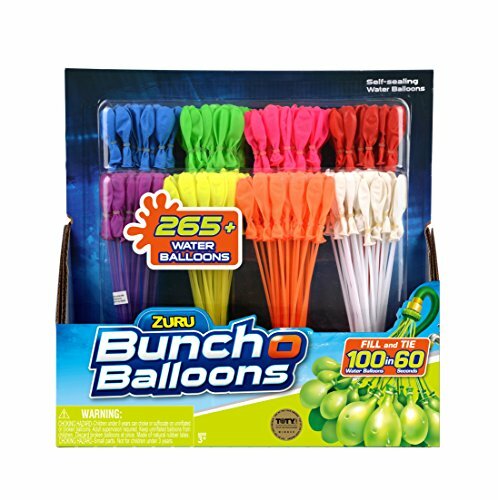 Whether you are having a large pool party or simply enjoying some family fun, there are many pool toys on the market. Later, we will check out some of the best pool toys available for children of all ages. One of the best pool toys for babies is also a bath toy – the 3 Bees & Me Bath Toys. 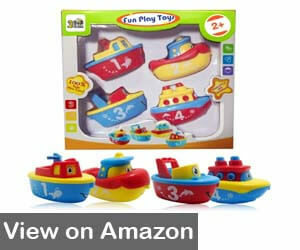 This collection of colorful, floating boats helps your baby learn about colors and numbers as they sail them in the bathtub or pool for hours of fun and adventure. 3 Bees & Me is a family-owned company that specializes in making toys that encourage imagination, interactivity, and fun play that both kids and parents enjoy. 3 Bees & Me are dedicated to creating toys that are fun and help in your child’s development in the following areas: fine and gross motor skills, creativity, sensory skills, and other educational objectives. Value pack includes 4 toys in one package. 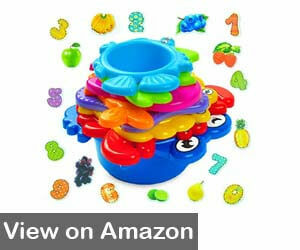 Promotes fine and gross motor skills and encourages creativity. Boats float separately or can be connected by the magnets that are built in to make a chain. 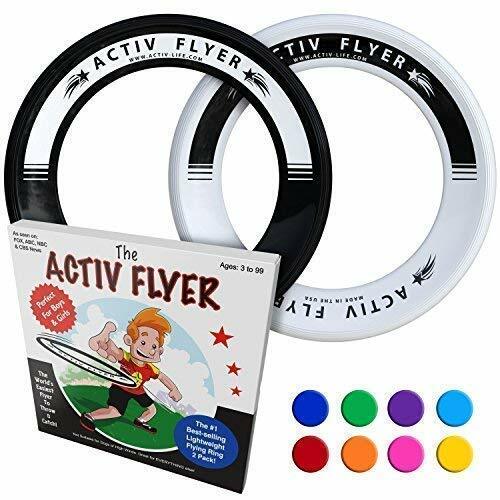 Designed with rounded curves and small in size so there are no sharp edges and your little one can easily maneuver them. Water gets inside the bodies of the boats and it is difficult to get out. Colonel Pickles Novelties Pool Basketball 2-Pak is one the best pool toys for toddlers. These basketballs are designed smaller than normal basketballs with a no slip grip so that little hands can hold them and throw around in the pool. 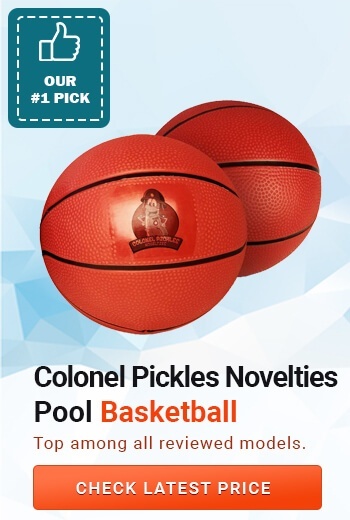 These basketballs can be used with any pool basketball hoop for hours of fun for the entire family.Located in Florida, Colonel Pickles Novelties is a family-owned started by a 16-year-old entrepreneur – with the help of his dad. Colonel Pickles Novelties offers a line of toys designed by someone with a fresh memory of what children are looking for in a toy. Their toys are non-toxic and built to last through hours of fun play for kids of all ages. 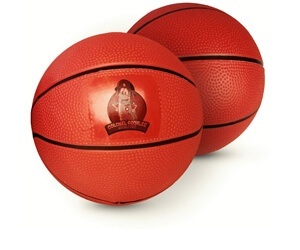 No Slip Grip design makes it easier for kids to grip and throw these basketballs. Made smaller and lighter than regular basketballs so younger children can handle them easily. 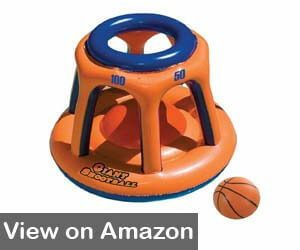 Compatible with Colonel Pickles Novelties Giant Pool Basketball Game and/or other brand pool basketball games. Made thicker to last longer and endure more play. Basketball hoop must be purchased separately. aGreatLIfe My First Stacking Cups is one of the best pool or bath toys for kids. These colorful stacking cups are multi-functional and can be used for hours of play on the beach or with playdough. Each cup is shaped like a different sea animal in assorted colors, so your kids can learn while they play. aGreatLife brand was founded by two friends in 2014. Their goal was to provide products that promote the message of thankfulness while helping families and friends create priceless memories together. aGreatLife partners with Child Hope to help fight childhood poverty in the Philippines – helping to create a great life for the many children forced to live in the streets. 8 bright and colorful stacking cups that can be stacked, used to scoop water or sand, or used as playdough molds to create hours of fun for your kids wherever you go. Includes brightly colored stickers that promote number recognition, teach counting, and teach your kids to recognize different fruits. Constructed from durable, non-toxic plastic that is BPA-free and safe for children. Each cup has spill holes that prevent water from building up inside. Promotes fine and gross motor skills as well as tactile awareness. Some parents felt they were smaller than they thought they would be. Kids are not the only ones that like to have fun in the pool. Adults also enjoy competitive pool games. The Blue Wave Aqua Golf Backyard Game is one of the best pool toys for adults – practice your golf swing alone or compete with friends from poolside. Comes with everything except the golf club for lazy days by the pool – floating green with 2 flags and cups, chipping mat with rubber tee, and 12 practice balls. Located in St. Charles, Illinois, the Blue Wave company started as a pool chemical company. Blue Wave is dedicated to providing products that exceed consumers quality expectations and now offers a wide range of pool accessories and equipment of the highest quality and durability. Floating green offers a challenging game for golf lovers. 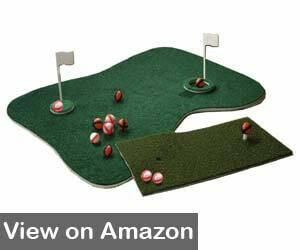 Chipping mat with rubber tee provides the perfect place to tee up poolside. 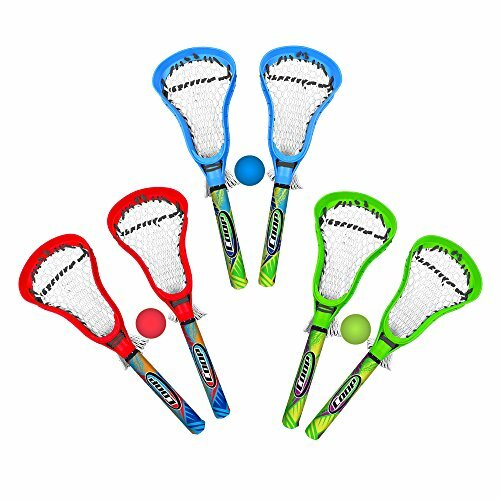 12 balls of 2 colors for competitive play. Balls are plastic with Velcro strips – they float if you miss the green. Some consumers stated that the Velcro comes off the balls easily. Of course, one of our favorite things to do in the pool is float on inflatable floats or rafts. One of the best inflatable pool toys available is the Swimline Giant Inflatable Swan Pool Float. A huge 75 inches, this float is big enough for two people and provides a perfect place to relax in the pool on lazy days. It also makes a beautiful decoration for your pool or small pond. Based in Edgewood, New York, Swimline was founded in 1971 and has become one of the world’s leading manufacturers of high-quality pool products. The company began as a manufacturer of pool liners, covers, and other pool accessories. In the 90s, they branched out to include a line of pool and water toys for children and adults. Holds up to 315 pounds, making this the perfect float to share a ride on. Wings and tail feather can be used as a headrest. Large enough that you can float on the water without getting wet if your want to stay dry. 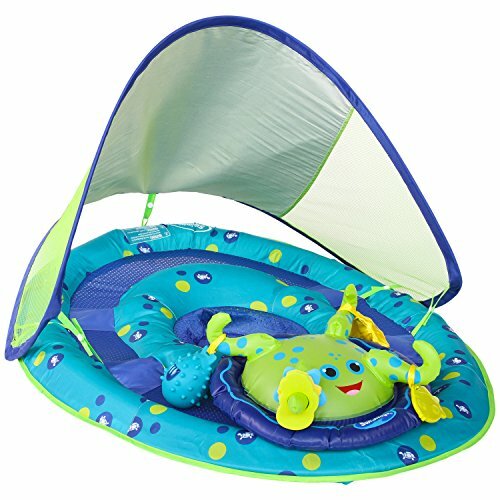 Can be used in the pool, ocean, or lake for hours of floating fun. Surface does not get hot to the touch in the sun. 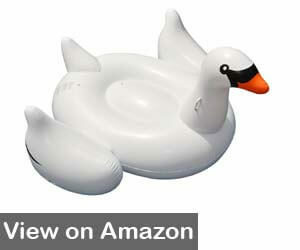 Requires a compressor or electric air pump – no blowing up with your mouth for this huge swan. Older kids, teens, and adults love nothing better than a competitive pool game that takes you all over the pool. As one of the best swimming pool toys on the market, the Swimline Giant Shootball Basketball Swimming Pool Toy fits the bill perfectly. With a giant, floating goal, this pool basketball game will provide hours of fun and competition for kids of all ages. Since 1971, the Swimline brand has been one of the leading providers of pool liners, games, toys, and pool maintenance equipment worldwide. Their line of luxury floats, games, and toys are durable and designed to provide as much fun in the sun as your family can handle. Made from heavy gauge vinyl for durability. Multiple ports for multiple shooters – each port has a point system for competitive play. This giant floating Shootball game measures 36 inches wide by 45 inches tall – providing plenty of room for multiple players. Includes one durable, inflatable ball. Compatible with any brand inflatable pool ball. Requires air pump or compressor to inflate. It wouldn’t be a pool party without a multi-player game for the kids and/or adults. One of the best multiplayer pool toys available is the Intex Pool Volleyball Game. The set includes a large, inflatable volleyball net and inflatable volleyball as well as pole bases that allow you to add anchor weights if desired. Intex Recreation Corp. is one of the leading distributors of above ground pools, airbeds, spas, pool toys, and more. For over 40 years, Intex has provided products that meet elevated standards of safety, quality, and value. The company is also dedicated to decreasing their carbon footprint by using recycled materials when possible. Intex is committed to providing products that make your family time more fun and relaxing – and their products are distributed in over 100 countries worldwide. 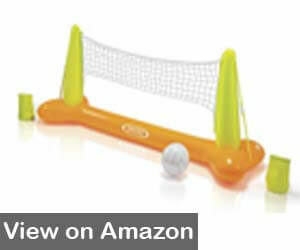 Inflatable base is made from 10-gauge vinyl and the volleyball is made from 7-gauge vinyl for more durability. Also includes a shelf box for easy storage. Anchor weights allow you to use this inflatable volleyball game in the pool or at the lake for hours of family fun in the sun. The inflatable ball is not suited for competitive games of volleyball – some consumers stated the need to purchase a different ball for the game. Install the correct barriers, alarms, and covers on and around your pool or spa to ensure that children do not have access unless accompanied by an adult. These should include a 4-foot high fence or barrier all the way around your pool with a self-latching gate; remove ladders from above-ground pools and place a cover over the top, and installing an alarm that goes off if anyone gets into the pool. Do NOT leave your child alone in or around water – not even for a few seconds. Stay within arm’s length of younger children. Young and/or inexperienced swimmers should wear a Coast Guard approved life jacket at all times in or around the pool. And if they use waterproof watch that time, it will be very good for them. Designate a responsible adult to supervise pool activity at all times. NEVER let anyone swim alone – even adults. There should always be someone there for emergencies. Teach your children to swim or enroll them in age-appropriate swim classes. Create and enforce rules for safe behavior – and be sure your children clearly understand the rules and understand basic pool safety. Rules can include – no running, no diving, never get in the pool alone, no pushing, etc. Maintain your pool with the proper chemical levels, filtration, and circulation to ensure that your pool remains clean and clear – you should always be able to see the entire pool all the way to the bottom. Never allow your child to play around drains – and always check to be sure public and/or personal pool have compliant drain covers. Teach safety and first-aid practices – the American Red Cross offers courses in water safety, first aid, and CPR. All members of the family should take these courses as soon as they are old enough. Even small children need to be taught what to do during emergency situations. Make water safety the # 1 priority in your home. There are several things to consider when choosing pool toys. Of course, safety is always first – even when selecting toys for your child to play with in the pool. When choosing any toys, always keep the phrase “safe but fun” in mind. Always check the manufacturer’s recommendations for age, weight, height, and appropriate use of any toy that you wish to purchase. These recommendations are made to keep your child safe and allow him/her to get the most fun out of the toy. Following manufacturer’s recommendations for usage also helps to ensure the toy lasts longer – for even more fun. Always check to see what material the toy is made from. Does it contain harsh chemicals or dangerous paint that can make your little one sick if it goes into the mouth (babies and toddlers love to chew). Does the toy float? Does it sink? Does it do both? Younger children who cannot swim should always have toys that float (remember to always be within arm’s length so the toy does not float away from your child). Older children who know how to swim love toys that sink because they can dive underwater to retrieve them. Be sure that floating toys are not too large for the number of people in the pool, which could create a risk of someone drowning if they are caught under the toy. 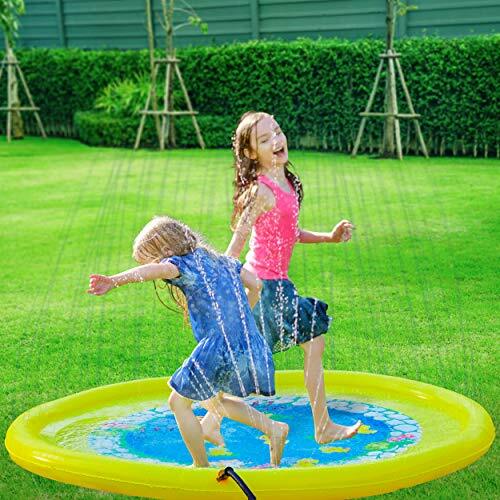 Summertime if fun time – and there is not better way to have fun with family and friends than pool toys. Pool time is a great time to bond with your kids – from babies to teens. 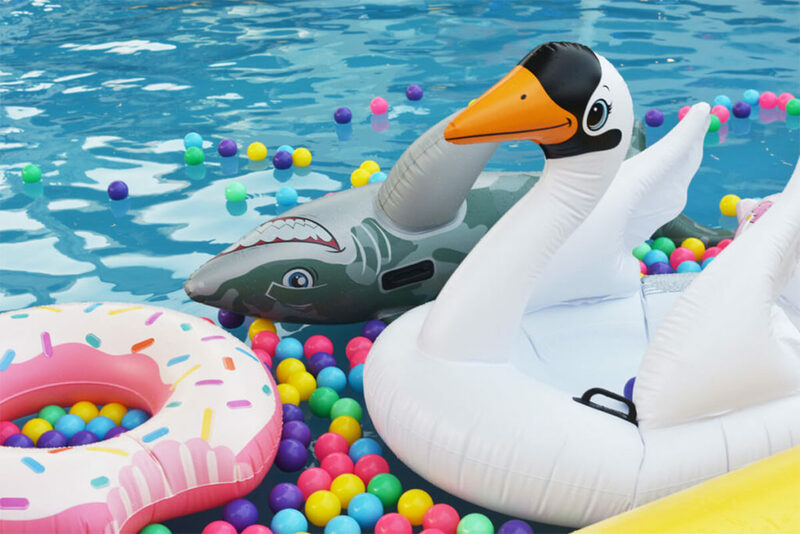 Whether you are looking for the best toddler pool toy, the best kids pool toys, or the best adult pool toy, I hope this list of some of the best pool toys on the market today provides your with a few products to make the most of the long, hot summer days with your friends and family. While you are having fun, always keep safety in mind. Follow the safety tips mentioned previously in the article – and, most importantly, never – never – leave your child unattended in a pool. Drowning takes only a matter of seconds. The sun’s rays are strongest and cause the most harm during midday hours. Be sure to plan indoor activities or have your child play in the shade during these hours. Shade can include a large umbrella, pop-up tent or canopy, or shade from trees. For extended periods of time in the sun, cover your child up as much as possible – long-sleeved shirts and pants. Have your child wear a hat that provides shade for his/her face, ears, neck, and scalp. Purchase wrap-around sunglasses for your child to wear in order to protect the eyes from harmful UV rays. Liberally apply sunscreen 30 minutes before going outside – and reapply throughout the day per manufacturer’s instructions. Be sure all exposed areas are covered – including lips, nose, ears, and tops of your child’s feet.